I’m creating 100 Jizo statues with the purpose of using them to take on and hold the participants suffering, pain, loss and sadness. After the stature is air dried the effigy will be destroyed thus releasing the emotions as the statue breaks and over time, the clay will go back to the earth. 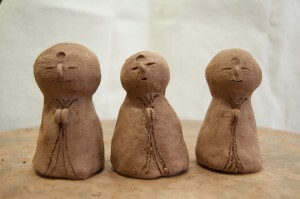 For more information please visit the 100 Jizo FaceBook page.